Discussion in 'Ships & Shipborne Weaponry' started by CNOCK, Jul 21, 2016.
nationality, WWII or may be WWI? Ah, Soviet M-08. Polish wz. 08/39 contact mine. The protuberances near the top of the mine, here with their protective covers, are called Hertz horns, and these trigger the mine's detonation when a ship bumps into them. It looks like a flower pot to me. I think it is the latest Pokemon , Go Armor, they are getting tougher. It was a hair piece, ears, eyes, one nostril to through you off, a cute shape.....I am thinking World of Pokemons. They have been sited in the Western Loire Valley. Good work Opana. As a comparison, German and especially British mines are usually a bit more oval. I remember seeing a model of one in a museum made with a kinder surprise plastic egg. The effect was stunning and with horns and a small added to , it looked perfect when painted in metal paint. Many more nations used round models but not many have those typical protuberances like the Soviets used. Anything from just drifting to being dumped there by someone who had lost interest in it. bit far for drifting to Belgium! Look up the rubber duckies they're finding thousands of miles from the location where the ship went down. I give the sea full props for doing thing mere humans wouldn't think possible. 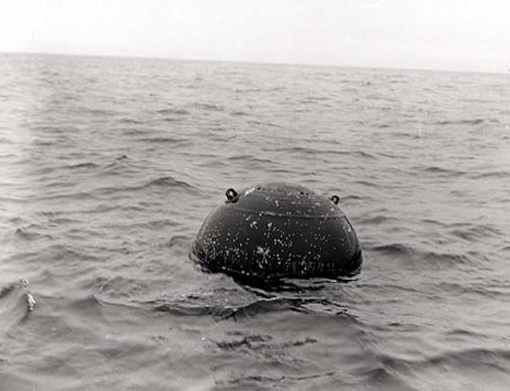 it is a WWI sea mine, as I already thought.